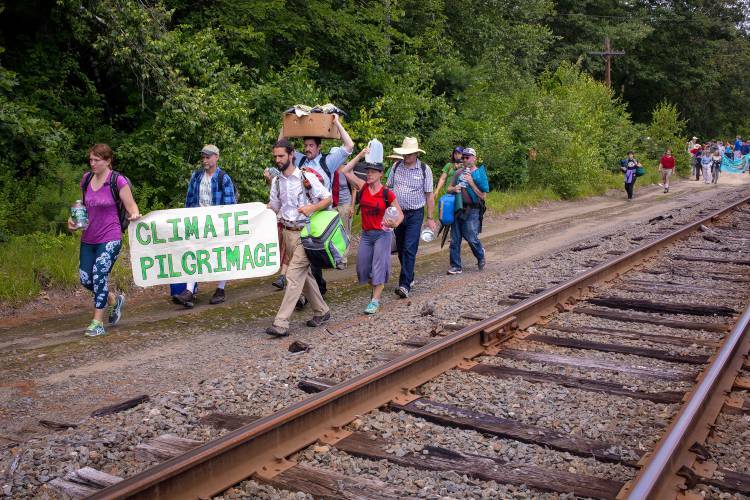 On the seventh day of the Quaker-led “Climate Pilgrimage” across southern New Hampshire, the participants, who were marching for environmental preservation, sat down and rested. They sat down right in the middle of train tracks leading into Merrimack Station in Bow, beneath scaffolding they had erected and in tents they had set up. The march, the result of over a year of planning, began July 9 at Schiller Station in Portsmouth and concluded with the sit-down in Bow on Saturday.